If you have been thinking about investing in some new brushes then there is no better time. 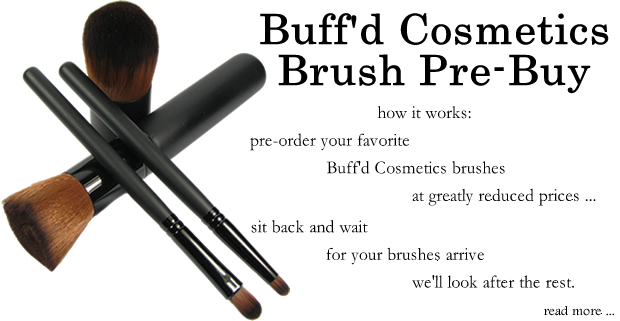 Buff'd Cosmetics is inviting clients to participate in their Cosmetic Brush Pre-Buy. *We have discounted all of our brushes by 45%. *Pre-buy takes place between Wednesday, May 16, 2018 and Friday, June 1. *Order as many brushes as you would like. There is no limit of how many brushes you can order. *Complete your order as usual. *On Monday, June 4 we will order all of the pre-buy brushes. *We should receive delivery of the brushes by June 22 and we should be able to ship all pre-buy orders on or before June 26. If you are not in a rush... now is the time to get some new brushes at unheard of prices!